Siesta Key Florida real estate gets a boost every time this popular beach hits the news. Earlier this year when Siesta Key Beach made the no. 1 spot on Dr. Beach's Top 10 Beaches in America list, residential and condo sales got a nice increase. This Beach has been popular with buyers for decades, but with the Internet spreading the word -- the secret is out! Temping many cold weather buyers in other parts of the world, Sarasota's warm climate and sunny skies along with its culture such as the opera, ballet, art galleries and famous Siesta Key Beach offers a full package resort lifestyle. Siesta Key Florida's activities and entertainment for retirees, families and young singles include fishing, boating, and tennis along with beach activities. Sarasota's mainland offers 80 plus golf courses if golf is your passion. Siesta Key Village shopping, restaurants and markets keep residents and visitors occupied also. Check out our Siesta Key Florida video on YouTube. Click on the picture below to experience a little of Siesta Key life. The Sarasota MLS currently reports 485 properties for sale on Siesta Key. There are 157 single family homes for sale, and buyers can choose from 293 condos for sale on Siesta Key. 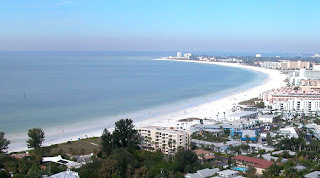 Pending sales total 73 so far in 2011; 39 of those pending sales are condos on Siesta Key. If you need more information on Siesta Key real estate, contact the John Allen Team at 941-544-6467 for an agent experienced with Siesta Key waterfront homes and condo sales.